Below is this year’s comparison chart with the best and most popular rifle scopes on the market. It should save you a lot of time making the right decision by easily comparing the different scopes’ brand, magnification (zoom) and price range. By clicking the link you can find more information about each product as well as its current price. The 4-12x50 Adjustable Objective Crossfire II riflescope is one of many configurations in the Crossfire II line. The Dead-Hold BDC reticle is good for hunting/shooting at varying ranges where estimating holdover is a concern. Want to know how to compare rifle scopes? If so, you are on the right place. Choosing the best rifle scope is a bit of a tricky task when it comes to the wide variety of distinct brands, power options, prices, and what you really need out of a scope. Therefore, before you decide to purchase a scope for your rifle there are a wide range of aspect that you need to consider. Generally, there are 2 main categories of scopes. These are fixed and variable power scopes. Choosing the right power of a rifle scope is the most significant part of the choosing process. You should compare rifle scopes before you buy. And here is how to compare rifle scopes. Magnification is actually the power of the glasses. Despite the fact that comparison charts are arranged systematically by magnifications like 2-7×33, often distinct manufactures have slightly unique configurations like 2-7×33, or 2-8×33. Therefore, objective and magnification has been included due to their specifications which are similar. In case you are new to the optics game, a 2- 8×33 implies that the scope has a magnification which is variable and range from 2x –7x and the diameter of the objective lens is 33 (thirty three) mm. A rifle scope is recognized by the magnification or the power and diameter of its objective lens. Generally, magnification of the scope is important while comparing rifle scopes. Users require reticles which have spaced dots or hash marks along the vertical and the horizontal axis. For long range shooting, shooters and hunters need dial for elevation and hold for wind. The target distance can be estimated or measured through dialing of elevation. Hold for wind becomes significant due to the frequent wind speed changes. As a shooter, there is no enough time for you to adjust turret(s), get back the gun within that short time and take shot before the speed of the wind changes. The significance of milling reticle especially in precision long-range shooting can be understood easily with the assistance of Nightforce Reticles which are equipped to provide accurate or precise aiming points. An estimated price is normally listed under every scope in the comparison chart. This will give you a fast idea of what you will pay for a give scope online. The prices are usually an estimated because price, promotions, discounts, and sales drops generally can change the estimated prices significantly. You can even click the pictures above every price in case you want to know the recent prices on Amazon. This will also enable you to know the recent prices on several other online retailers. Just select the best that you can afford as far as purchasing a rifle scope is concerned. It is important to always check the estimated prices which are listed under scopes in the comparison charts. Consider eye relief. This is the distance measured from the eye to the back of the scope. Nearly all riffle scopes have an eye relief of between 3“ & 5“. When you adjust the magnification, the eye relief of the scope will also change. It is always important to know that other scopes have a much wider range of eye relief compared to other scopes. Generally speaking, the less variation as far as eye relief is concerned the better. Eye relief is actually needed in order for you to be able to see the picture of the target clearly. The target may be positioned at a considerable distance. Quality of glass is one of the features which distinguish between a poor and a good riffle scope. With a glass which is sharp, the user can be able to watch through clearly even at a lower power magnification. Despite the fact that many consider light transmission only as the feature to compare, there are no available standard test methodology. One of the best ways to know glass quality in a given scope is to just compare different devices side by side. Here are some of the known and respected manufacturers in this industry. 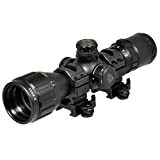 They include Optics, U.S, Zeiss, Leupold, Schmidt & Bender, Nightforce, and Swarovski. In conclusion, there are different possibilities as far as selection of the most excellent scope for a rifle is concerned. Therefore, matching the scope to the rifle and even the shooting type is important. You should not purchase outdated scopes. The technology is changing fast and so are the times. The brands which are big are continuously engaged in development processes and research to pave way to innovative technologies and features. For this reason, ensure that you choose the latest model in order to enjoy hunting or shooting experiences. Some of the things to consider while comparing rifle scopes include magnification of the scope, milling reticle, estimate price, eye relief, and quality of glass. It is difficult to find two similar rifle scopes but it is even more difficult to find two identical rifle scopes. Even though the exterior can be almost or completely identical, they may be different with one another in various characteristics. And even those rifle scopes that have similar appearance and characteristics may have completely different prices. The following are the four best rifle scope brands in the market. Nikon products are well known for their user-friendly models to both beginners and experienced hunters. Nikon scopes have power series and optic that gives vivid and sharp viewing designed to manage sharp shots. 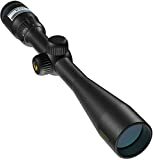 Before you make any Nikon rifle scope purchase, you need to be aware of the features that it has and as well as its price. You come to realized that the rifle scope does not have to be the most expensive to be the best for you but rather the one that will make best fit to your personal lifestyle and/or personality. Nikon rifle scopes are made to suit the need of their customers, which is equipped by the corporate philosophy, ‘Trustworthiness and Creativity’. Nikon is well known for its lenses which have multi-purpose durability and endurance. The lenses are designed with a coat of several layers of anti-reflective compounds, which is the secret to clear vision and accuracy as you aim. Many people are familiar with the company leapers or UTG which is well known for selling firearm accessories such as optics, lights and mounts. Their products are affordable and are quality made. There are many Leaper UTG scopes to choose from depending on which one will suit you best. There are scopes equipped with 36-color scheme illuminated reticle which was developed for those people who may have difficulties in seeing various colors in the reticle. This allows them to switch through various colors until they are able to find the color that sticks out for them. Accushot Tactical series is a 30mm tube scope that has an illuminated reticle in either green or red and has either a mili-dot or a circle-dot reticle. What is interesting for this scope is when the battery dies, the reticle is still visible as black. This scope has 1-4 power setting. These scopes come with mounts included, an extended eye relief of 5 inches and they are parallax preset for 100 yards. 1. Crossfire rifle scopes made in China, which are least expensive among the four lines. It covers a large amount of configuration from 3×32 (crossbow), 2×20 (pistol) scopes to 8-32×50 built on a 30mm tube. 2. Diamondback rifle scopes made in Philippine. 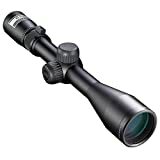 The scopes range from 1.75-5×32 on up to 4-12×40 and they are aimed at typical big-game hunting applications. 3. Viper rifle scopes made in Philippine. Viper HS and PST scope lines are designed for tactical applications and precision shooting. 4. Razors HD rifle scopes that are world-class and manufactured in Japan. The two models are 1-4×24 on a 30mm tube and 5-20×50 built on a 35mm tube. Bushnell rifle scopes provide guaranteed excellent and quality optics and they have a wide range of models for you to choose from. It is among the most experienced high quality optical products maker. It features multi-colored lenses that are made to a high standard to deliver excellent optical performance such as fog-proof and waterproof qualities. Bushnell rifle scopes are recognized by leisure rifle shooters and hunters all over the world providing range for individual requirements and budget. Bushnell has delivered high quality optical products over the years of their experience and understands the intricacies of hunting and their followers. That is why they developed a special Dusk and Dawn Brightness multi-colored optical lenses for the hunters to make hits during the dusk and dawn periods. In hunting, accuracy is the most important thing and you can be assured that your performance will not be limited by Bushnell rifle scope due to its high quality and accuracy. Riffle scope design is as complex as that of a telescope or camera and therefore, lenses are the most important in any of the riffle scope brand. To be able to choose the best riffle scope you check the quality of images. This is determined by the chemical composition of the glass and the method of manufacture. The better the quality of glass the high quality your images will appear.